This was a back and forth discussion talking about the economy, how the recession is affecting search, and what you can do to minimize marketer stress. Sorry if this post jumps from topic to topic. Dave Davies talked about how his Canada-based company feels the effect of the American dollar, since the American dollar is not what it used to be. However on a positive note, more Canadians are coming to the US to spend their money because of the strength of the Canadian dollar. He mentions not to forget to go back to the SEO basics, title and meta tags can help drive more organic traffic to your site. This recession has really made companies focus on their marketing dollars. Marketing departments are starting to really look at the numbers and analytics, making sure that their marketing dollars are being maximized. The recession can be a good thing, in terms of making companies looking harder at where their dollars are going. 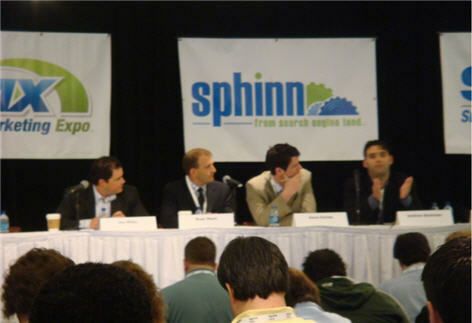 Russ Mann talks about how the fortune 500 companies are allocating more of their budget towards Search Marketing. He notices that the high level managers in organizations are starting to tighten up their marketing budget. He notes that marketing is the first thing cut when a company needs to cut costs. He went on to say that even though marketing departments are cutting costs, search marketing is still going strong because of the tractability and measurable. Even before spending money on search, you should be spending money on market research. You need to learn who your target customers are and how you can acquire more of them, before you start throwing money at search. He also says that you are starting to see new companies emerge that are leveraging search, mobile, and social technologies. Really focus on the Life Value of a customer. If you are properly recording your data in your CRM software, you can start to see how much the average client is worth, through the life cycle. Russ closed by saying that the marketers who only think about the short-term results will fail. You need to focus on where you want your company to be, your objects, your goals, and what is the best long-term strategy you can implement. Jon Miller says “we’re in the worst possible non recession”. He went on to discuss a study of what people will be spending their stimulus check on. He said the top 3 things people are doing with their check is paying down debt, paying for gas, and paying for food. The smaller companies are really feeling it because they don’t have the deeper pockets, like these enterprise corporations. He thinks that Search Marketing will help still with branding. Even if you don’t see the conversions like you use to, you are still building your brand. Since conversions are lower and spending is down, you need to focus on getting as much out of your current sales as possible. Really work on testing your site to get the most out of the people that are coming to the site and are ready to buy. He gave the analogy of dating. When you start dating someone, you wouldn’t propose. You need to learn about your partner and build trust. Same thing applies to online. Learn as much as you can about your target market and cater your marketing to meet their needs and goals. Jon closes with saying that the majority of advertisers, who are wasting money, are the ones spending their dollars on shouting their message to everyone, instead of targeted specific customers. Jon talked about spending more money on your offer, trying to market to the ready-to-buy customers. Andrew Beckman talks about looking at international clients because they can afford to spend more money while our country is in a recession. In this time of recession, Andrew feels that we really need to focus on the analytics more. Look at heat maps, do more testing, really study the data so that you can maximize your ad spend and get the biggest ROI. He talked about his personal experiences with his PPC clients. Identifying the keywords that are converting and then building content and links around those keywords. He also says that plurals work much better than singular in PPC campaigns. Jeffrey Rohrs took a poll form the audience to see who was negatively affected by the recession or positively, about 65% of the people thought it has a positive effect, which I found a bit surprising. He took another poll from the audience to see who would put more money towards the acquisition of a new client or towards maintaining you current clients. About 90% of the audience would put their money towards maintaining their current clients. 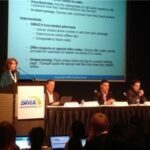 Live From SMX Seattle: Closing The Loop: Are You Tracking Every Lead?